About once a week, one of my neighbors calls out to me, “What’cha painting now?” It’s usually a good question, because I’m always up to something. Last week, that something was tackling one of the last remaining builder’s beige walls in my home. I didn’t have the painters paint this one Lindsay White because I had other plans for it. And those plans involved yellow paint. As a HomeRight Brand Ambassador, I have the opportunity to test out their products. 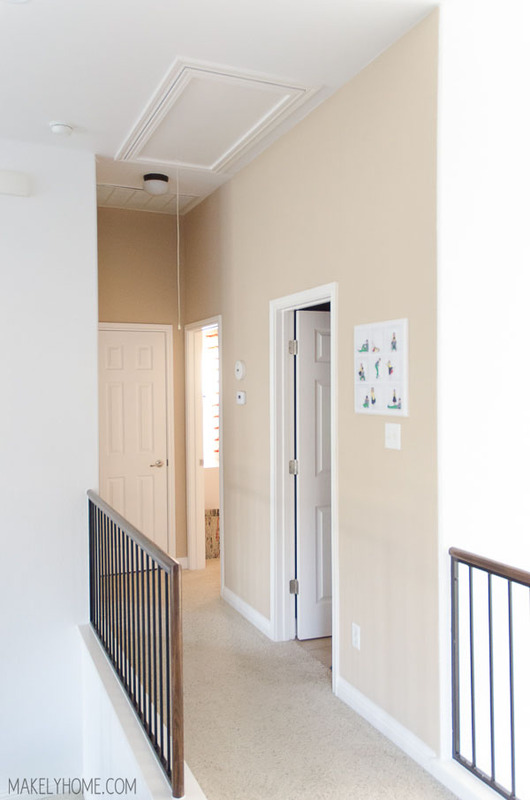 Before I got started on this little hallway, I went on their website in search for something that would make painting this area a lot easier. I mean, I HATE that part of the wall. A mini-roller won’t really fit in there, so I have to paint the whole thing with a brush. Oh. My. Word. THE HUMANITY! But then, I found this little gem – the HomeRight Quick Painter Edge Painter (Amazon affiliate link). 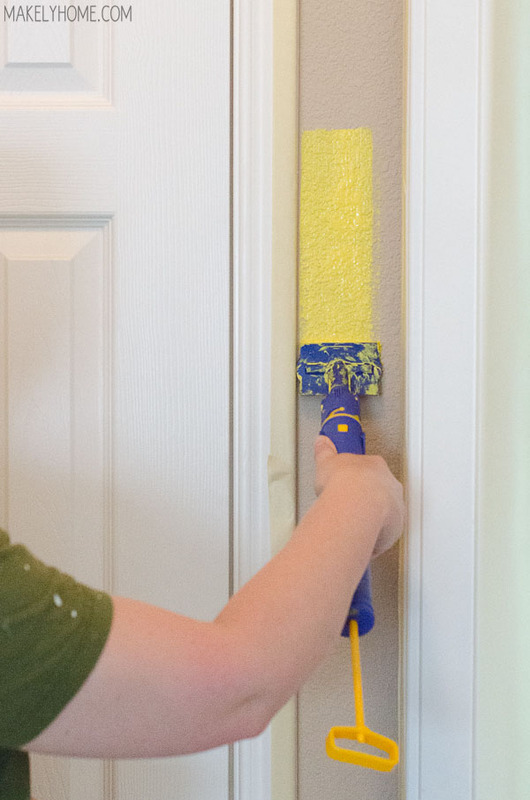 Much like HomeRight’s other products that I now can’t live without (the PaintStick EZ Twist and the PaintStick Mini), this little painter holds the paint in the handle to keep you from breaking your back by constantly bending over the paint can. Now, I have tried other edge painters like this that didn’t live up to the hype. But, this one does. Why? 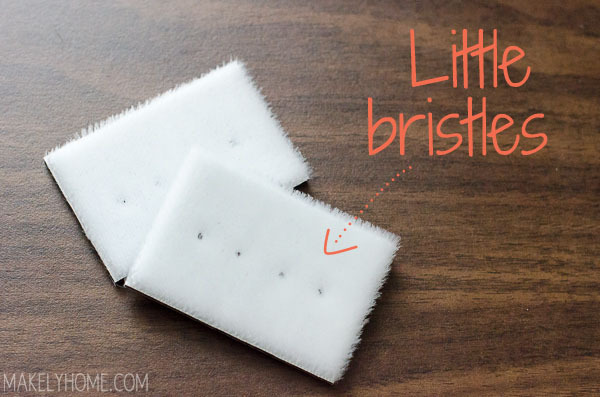 Because instead of the painting pad being made up of flat, woven fiber, this one has replaceable pads made of teeny tiny bristles. It paints a lot more like a paint brush than other edgers I have tried. The first time I used it, I made a HUGE mess…because I didn’t read the directions. 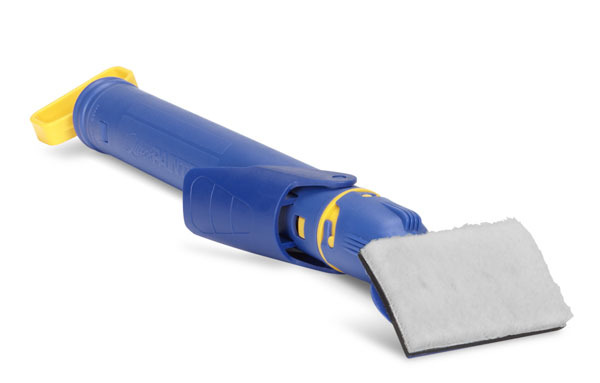 Do not – I repeat, DO NOT – pull the trigger unless your Quick Painter pad is flat against the wall. Otherwise, you’ll have paint dripping down your arm and a paint covered tool. But once I learned from that mistake, I was able to paint that pain in the rear space with ease. I used the Quick Painter to paint around the door trim, baseboards, cut in at the ceiling and any little PITA sections of wall that I couldn’t fit my roller. Then, I finished off the painting by rolling the walls with my EZ Twist Paint Stick (Amazon affiliate link). It honestly took me longer to tape off all the trim than it did to paint the walls. The result? Well, it’s bright. It’s SO bright. I’ll even say its regrettably bright. We’re going to talk about this color again in a few weeks. At least the paint job itself turned out great! How much do you hate that spot between the door trim and wall? Have you tried the HomeRight Quick Painter? This post is sponsored by HomeRight. All opinions and regrettably bright colors are my own. Yeah, I know! 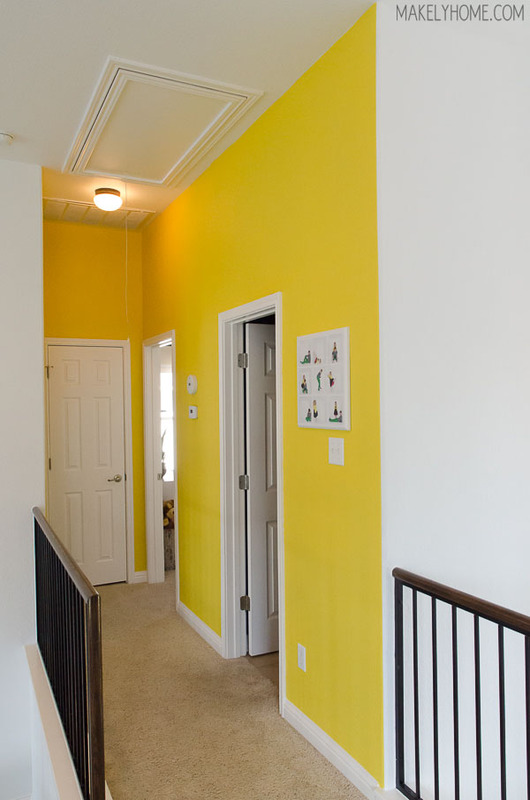 When I got the first coat up, I was like, “Hmmm…this isn’t quite the look I was going for.” Then, I did the second coat and knew right away that it was a “Nope!” This was definitely a color that was totally different on the chip that it was on the wall. And I need that little tool! Nope, not gonna love it. I knew right away. LOL! Right?!? I actually think this one may be brighter than McDonald’s yellow. Gah! It’ll be gone soon enough – the good thing about paint is that I can just redo it. I have a ton of those little places so I will definitely pick one of these up. Thanks for the tip. The bright yellow walls made me smile. I hope you kept them.